ters yesterday 1 from Orrilla and 1 from H Husted. Wrote 4 letters last night 1 to I. R. Phenis and 1 to each of the County Commissioners in regard to Recorders office. 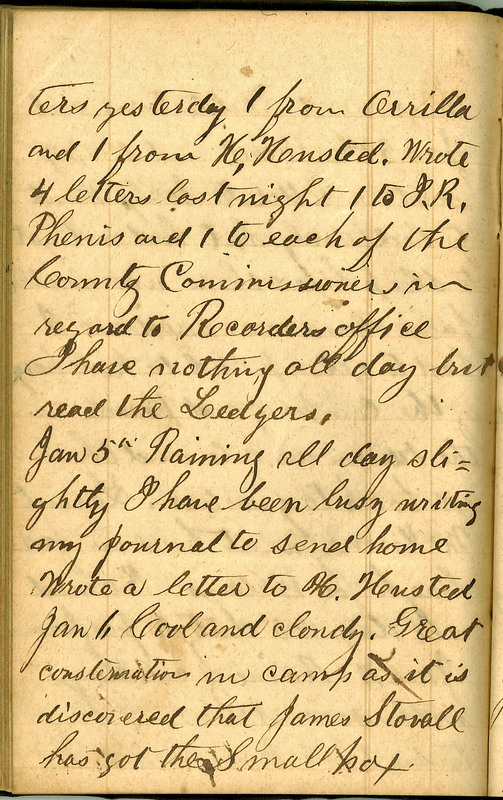 I have nothing all day but read the Ledgers. Jan 5th Raining all day slightly. I have been busy writing my journal to send home. Wrote a letter to H Husted. Jan 6 Cool and cloudy. Great consternation in camp as it is discovered that James Stovall has got the Small pox.